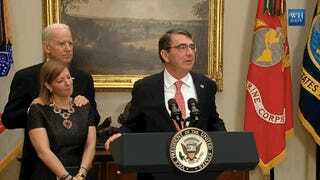 During the swearing in of new Secretary of Defense Ashton Carter Tuesday, Vice President Joe Biden intimately shared...something...with Carter's wife Stephanie. We've been here before. Yes, we surely have. As Mashable points out, the moment was quite tender. It occurred immediately before Carter called Stephanie "perfect," but after Biden called her over from where she was standing on the side of the room so she could be front and center. It seems like everyone loves Stephanie. And why not? Stephanie seems great.